Alfredo led the group in the Four Way Test. Today we had 16 members present, as well as Natalia Lysova, who will be a member soon! Also Whistler Get-Togetherremember the date of September 3 for the day at Whistler, biking or not, with lunch and a BBQ at Abigail and Jason’s house. Followup with Abigail for details. 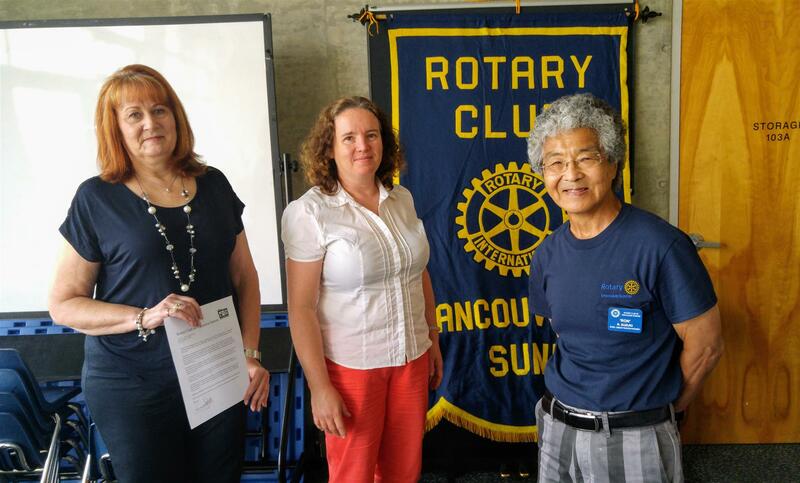 Our guest speakers today were Doreen Drysdale and Sheila Polard, from the Life Saving Society. Promoting lifesaving and lifeguarding programs, and improving aquatic safety through youth education are just two ways the Lifesaving Society is able to serve the public. The Junior Lifeguard Club creates a focus for children aged seven years and up, preparing swimmers with valuable lifesaving skills. The Canadian Swim Patrol and Bronze Star are programs specifically designed for young swimmers. August 9 - Business meeting.